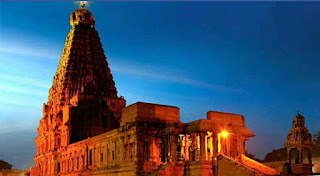 Here is Some Information about Brihadeeswara Temple in Thanjavur Tamil Nadu India. 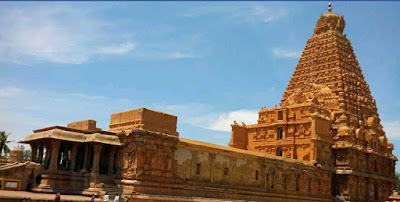 The Brihadeeswara Temple is located at Thanjavur in Tamil Nadu Kerala.Showcasing pure Dravidian architecture, the temple was built in the Chola capital of Tanjavur under the aegis of the Chola king Rajaraja Chola in 1010 A.D. Designed by Sama Varma, the architecture of Brihadeeswara temple is unique in that the temple casts no shadows on the ground at noon during any time of the year. The Brihadeswara temple is one of the most ancient and the most celebrated Hindu temple in the world.The UNESCO has adjudged this thousand years old temple a "World Heritage Site". 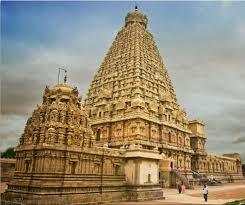 Brihadeswara is the most illustrious and a brilliant example of the Dravidian style temple architecture. The building that carries the main sanctum is known as the 'Periya Kovil'. This stands amidst fortified walls that were probably added in the 16th century. The 'Vimana' of the temple is about 70 meters and is among the tallest of its kind in the world. The 'Shikharam' (crown) of Brihadeswara temple is itself very large and heavy (81.25 tons) and has been carved out of a single stone. Surrounding the Brihadeeswarar Temple is a huge compound, with walls that are over 15 m high. Only the inner sanctum sanctorum, along with the gopuram (tower) adorning its top, was constructed by Rajaraja Chola I. This construction took a period of twelve years. To further enhance the beauty of the temple, the king got it adorned with a 12.5 feet tall finial, which is made of 9.25 kg of copper and is plated with 800 gm of gold. 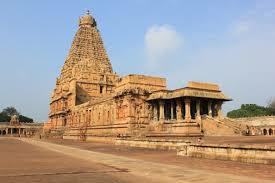 Subsequent rulers of the Chola dynasty added to the temple, never once letting the construction go out of sync. The Brihadeeswarar Temple was built to display the emperor's vision of his power and his relationship to the universal order. On the 275th day of his 25th regal year (1010 A.D) Raja Raja Chola handed over a gold-plated kalasam (copper pot or finial) for the final consecration to crown the vimana. 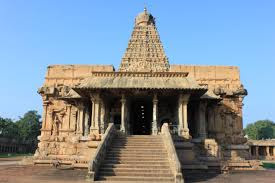 Located in the nerve centre of the Chola empire, the temple attracted musicians, scholars, craftsman and merchants. Most notably, it served as a platform for the dancers who excelled in the traditional dance form of Bharatha Natyam. The Cholas were ousted by the Pandyas. The Pandyas were followed by the Vijayanagara empire. In 1535, the Vijaynagar king installed a Nayak king, hence, the era of Tanjore Nayaks which lasted till mid-17th century. In 1674, the Marathas conquered Tanjore. Later, like the rest of the country, Thanjavur too fell into British hands. The inscriptions and frescoes on the walls of the temple record the rise and fall of the city's fortunes. The Brihadeeshwara temple has over a 29 sq.m base. It has a soaring vimana (Srivimana) and a relatively short gopuram. The inner sanctum and the gopuram were constructed over a period of 12 years from a single piece of granite weighing around 80 tonnes. The dome was hauled into place along a 4-km earthwork ramp. The Srivimana or the central vimana has 16 tiers rising to a height of 216 ft, one of the tallest in the world. It symbolizes Mount Meru. The presiding deity is Shiva in the form of a Lingam called Peruvudaiya, Rasjarajeshwaramudvya. The massive Lingam is housed in a huge 2-storey garbhagriha. The inner wall of the garbhagriha or the sanctum sanctorum has sculptures of 108 dance poses called karmas performed by Lord Shiva himself. A huge statue of Nandi measuring 6 m length and 3.7 m in height faces the inner sanctum. The statue of Nandi is a monolith and weighs 25 tonnes. It is, in fact, one of the largest Nandi statues in India. Before you enter the sanctum sanctorum, you will see the two idols of Ganesha in the corridor. On tapping the two, you will feel the sound traveling through stone in one idol and through metal on the other. There is a 16.5m (55ft) high temple dedicated to Lord Subrahmanya that is considered to have some of the best carvings in South India. 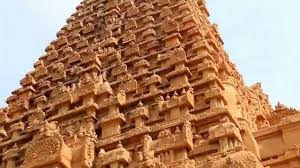 By Road : There are many public and private vehecals available to reach Brihadeeswara Temple in Thanjavur in Tamol Nadu. By Rail : The Nearest Railway station is Thanjavur junction. By Air : The Nearest Airport is Tiruchirapalli Airport. (58 kms). Hotel Tamil Nadu, (331421; fax 331970), Gandhiji Rd. Hotel Sangam (339451; fax 336695: Email: hotelsangam@vsnl.com), Trichy Rd. Hotel Parisutham (331801; fax 330318: Email: hotel.parisutham@vsnl.com), 55 Grand Anicut Canal Rd.